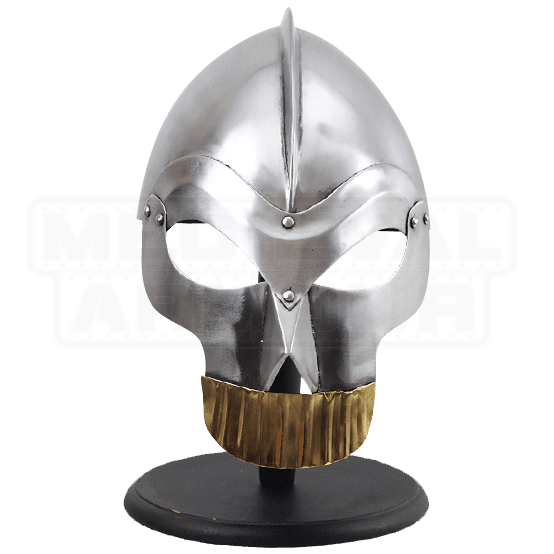 Medieval style and an intimidating look make this Skull Helmet with Gold Teeth perfect for costumes and reenactments. Your opponents will know you mean business when you wear this full-face cover, 18-gauge stainless steel helmet. The fixed face guard resembles a menacing skull face and provides excellent protection. Two large eye holes offer good visibility and the golden row of teeth add flair to this unique piece of armour. A leather inner lining is included to ensure a comfortable fit. If you are looking for a way to complete your look and stand out from other warriors on the battlefield, be sure to pick up this Skull Helmet with Gold Teeth. This item is handmade. Measurements will vary from piece to piece.